While it’s been talked about more than once this offseason already, there’s still some mystery as to what the Steelers are going to do with the outside linebacker spot that seemed to be in flux last season. CBS Sports’s Jason La Canfora shed some light on the subject during an appearance on 93.7 The Fan in Pittsburgh, and what he said may come as a complete stunner to most Steelers fans. 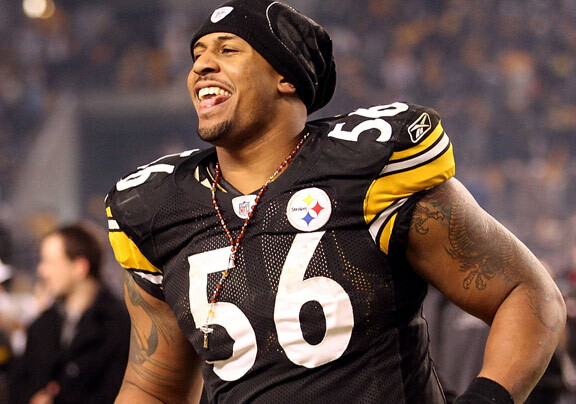 The NFL Insider said in his opinion, he sees the Steelers keeping high-priced linebacker LaMarr Woodley around, this despite a salary that will see him make $8 million in 2014 after he made $3.6 million in 2013. The cap hit is even worse for the Steelers, as Woodley’s inflated salary will eat up $13.5 million in the 2014 season, last season his cap number was $9.1 million. The move to keep Woodley means that, according to LaCanfora, the Steelers will lose out on outside linebacker Jason Worilds, who was maybe the best defensive player on the field for the Steelers in the last half of the season. LaCanfora feels that Worilds will get a lot of attention on the free agent market, and the up and coming LB will get an offer the Steelers simply can’t match. It’s a bitter pill to swallow, as the combo of last years first-round pick Jarvis Jones and Worilds would make for a solid 1-2 punch at the two OLB spots for the Steelers. “I don’t think they’re cutting Woodley,” LaCanfora said on the 93.7 The Fan morning show. There is some good news in all this gloom and doom according to LaCanfora, and that has to do with safety Troy Polamalu, who LaCanfora says will take a cut in pay but will stay with the Steelers. Be the first to comment on "LaCanfora: Steelers Will Keep Woodley, Won’t Be Able To Sign Worilds"